For over two decades, the City of Tampa Black History Committee, Inc. (COTBHC) has recognized City of Tampa employees, supported local youth, and celebrated Tampa’s rich heritage. Now, we offer you the chance to make a positive impact on the Tampa Bay region through sponsorship of the 4th Annual Golf Tournament. 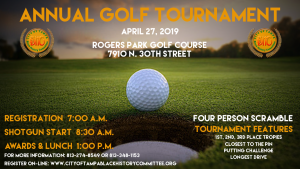 The 4th Annual Golf Tournament will take place on April 27th at 8:30am at the Rogers Park Golf Course, located at 7910 North 30th Street, Tampa, FL 33610. Download the Registration & Sponsorship Form Here! On behalf of the COTBHC, I thank you in advance for your financial support and look forward to greeting you at our 4th Annual Golf Tournament. For over two decades, the City of Tampa Black History Committee, Inc. (COTBHC) has recognized City of Tampa employees, supported local youth, and celebrated Tampa’s rich heritage. Now, we offer you the chance to make a positive impact on the Tampa Bay region through sponsorship of the 2nd Annual Golf Tournament. The 2nd Annual Golf Tournament will take place on April 29th at 8:30am at the Rogers Park Golf Course, located at 7910 North 30th Street, Tampa, FL 33610. This event supports the 2017 COTBHC Scholarship Awards in providing scholarships to outstanding high school graduates before they head off to the college or university of their choice. This event also offers a great opportunity for your organization to reach the Tampa Bay area with your brand and targeted message via the golf tournament. On behalf of the COTBHC, I thank you in advance for your financial support and look forward to greeting you at our 2nd Annual Golf Tournament.